The State Partnership Programs add an additional advantage to traditional plans by rewarding those who have long-term care insurance. 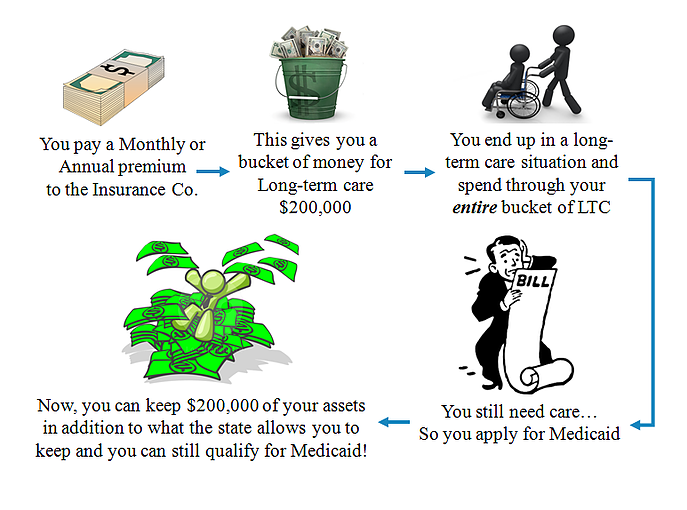 It works by allow-ing a person to protect assets from Medicaid spend-down requirements should they need care beyond what their policy will pay. For every dollar the insurance company pays for care on your behalf, you are allowed to protect an extra dollar and qualify for Medicaid assistance. This may be the difference between being broke on Medicaid and still have some savings left. Traditional long-term care policies still have a place and can be a very effective way to protect your nest egg and family from the high costs of long-term care. We’ll be glad to show you how these plans stack up in today’s environment. 64-year old female is worried about running out of money if she ends up in a long-term care situation. She purchased a Traditional long-term care insurance plan that is State Partnership Qualified. Should her health become compromised she will now have a pool of insurance money for $150,000 to pay for care. If she uses all of this money and still needs care, she can now ap-ply for Medicaid. Without the insurance plan she would have to spend down her savings to $2000 to qualify for Medicaid. However, since she had a partnership long-term care insurance plan she is able to keep $152,000 of savings. Partnership Plans allow you qualify for Medicaid and keep an additional dollar of your savings for every dollar the long-term care insurance company paid for care on your behalf. A husband and wife both 65 have $285,000 in retirement savings. They each purchase a State Partnership qualified long-term care plan that gives them each $150,000 of long-term care benefit, ($300,000 combined). The husband gets diagnosed with Alzheimer’s’ disease and needs long-term care. Since they have a shared care plan, he is able to use $200,000 of the $300,000 that they have available between them for long-term care. After he spends through this money, he still needs care so he now applies for help from Medicaid. Without insurance, the wife would only be able to keep $119,000 of their savings and the rest would have to be spend down on care costs for her husband. However, because they had a partnership long-term care policy, she can keep an additional $200,000 (amount paid out by insurance company for care) which means she can keep their entire savings and still have her husband qualify for Medicaid.